Going camping in Ohio State Parks? 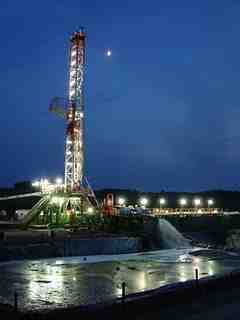 With marcellus oil drilling rigs around, you won't need a lantern at night. This is testimony against proposed legislation to facilitate hydraulic fracturing in Ohio’s state parks, forests and other public land. I plan to present it tonight before the Ohio House Agriculture, Environment and Natural Resources Committee. This legislation is on a fast track and could even be voted on this week. I urge you to contact committee members now. I’ve attached a PDF with their contact info. I grew up in inner city Cleveland in the late ’50s and early ’60s. We lived on West 40th Street, literally a stones-throw from Cleveland Electro Metals. At night, we could look out the kitchen window and see workers silhouetted in the orange glow of the huge furnace where they melted down sheet metal from old airplanes and buses. It was a smelly, noisy and unhealthy place to grow up. But my father worked hard to make a better life for us. He made it a point to take two weeks off every summer and take us to East Harbor State Park. I lived for those two weeks. I looked forward to camping, hiking through the woods and exploring the marshes and the lakeshore. The fresh air — the smell of grasses, flowers and trees — was delightfully foreign to me. Sound was a unique experience too. There was no constant rumble of machinery or jarring clang of metal dropping from overhead cranes. There was silence, with interludes of birds singing and frogs croaking. You could even hear insects buzzing. I lived most of my adult life in the city, but I never lost that connection with nature. Even during difficult times in my life, I often returned to find solace at East Harbor State Park and later Mohican State Memorial Forest. Fourteen years ago, I got the opportunity to move to the Mohican area. I jumped at it. I feel so lucky to live in a place that’s special not just to those who live there but to hundreds of thousands of other Ohioans who come here for recreation and to spend quality time with their families. I’m nearly 60 years old. I’ve resigned myself to living out the rest of my life in the Mohican area, enjoying the parks, forests and rivers. In my worst nightmare, I never thought I’d find myself desperately struggling to save it from being industrialized virtually overnight. Make no mistake about it, that’s exactly what this proposed legislation would do. Once that Pandora’s box is opened, there will be no closing it. Once the heavy equipment rolls in, the ground is opened up and toxic chemicals injected, it will never be the same. Some of it will start looking all-too-familiar — like the smelly, noisy, dangerous inner city world I grew up in. Our state parks and forests would become fragmented, industrialized and lost forever to future generations. Please don’t let that become your legacy.